Although the weather is getting chilly this month, dreaming up a new screened porch for your home will have you looking forward to the warmer months of 2019. Although the weather is getting chilly this month, dreaming up a new screened porch for your home will have you looking forward to the warmer months of 2019. However, with this fun and versatile addition to your home, you can easily enjoy a spring day or fall afternoon comfortably in any weather. Even on the rainiest days of 2019, adding a screen porch is the perfect way to extend your living space. As you dream up your new screen porch design for 2019, keep in mind these three important considerations. Where will your new screen porch be located on your home? This question should be one of the first considerations as you are designing your new space. As the space that connects your home and your outdoor space, your screen porch will play an important role as an extension of both your indoor and outdoor living spaces. Not only will your screen porch be an escape from unpleasant weather outside, but it will also be a place to warm up on sunny days. With this in mind, the location of your new screen porch plays an important role in its function and your ability to enjoy it during the year. 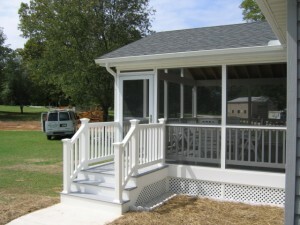 Consider the accessibility of your screen porch from other points of your home. Should you add stairs or a ramp? With this in mind, it is essential to consider whether or not everyone in your family can access this room safely and comfortably as you entertain. Your new screen porch should be a place in your home where everyone can enjoy time outdoors and feel comfortable at the same time. In considering this, it is crucial to keep the floor level and the room open, so that is easily accessible. Once your screen porch is built, your details and finishing touches will play an essential role in making it feel like a part of your home. Don’t underestimate the importance these finishing touches such as decorations, furniture, and cozy details for your new space. With beautiful decor and cozy furniture, your screen porch will quickly become a new favorite room of your home! Enjoy a New Screen Porch for Your Home this Year! Mid-Atlantic Deck & Fence has almost 30 years of experience in building beautiful custom fences, gazebos, screened-in porches, and decks throughout the state of Maryland. We have the expertise to design your dream fence or custom deck and have it installed in a headache-free process. Give us a call at 1-800-833-9310 or visit us online for a quote today! We offer many different styles of fencing and decking in addition to custom options designed specifically to suit your preferences and tastes. To see examples of our work and get more tips on how to choose the right decking for your family, follow us on Facebook, Twitter,Houzz,Pinterest, Google+, and YouTube.